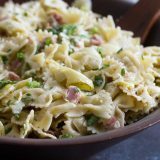 Delicious and super easy to make, this Artichoke Pasta Salad is filled with pasta, artichoke hearts, prosciutto and an easy vinaigrette. This salad is perfect for summer potlucks or family dinners. Make the vinaigrette: combine the vinegar, lemon juice, and mustard in a food processor or blender. (I use the twister jar on my Blendtec.) Stream in the olive oil until it is smooth and combined. Season to taste with salt and pepper. Make the salad: Cook the pasta according to the package directions; drain and rinse. In a large bowl, combine the pasta, artichokes, prosciutto, green onions, parsley, basil and cheese. Mix well. Pour the dressing over the salad and toss gently. Cover and chill in the refrigerator for 4 to 6 hours before serving.